Here’s something to really throw some of us for a loop: locking down our innate nature and tendency towards freedom and flow–as in the standard 9-5 office setting or high school classroom, or, as in my own life, the 12-hour-day entrepreneurial workweek–actually works AGAINST our ability to learn and produce. 2. The restriction of our natural inclinations to move–both our bodies, as we stretch and walk and run–and our mind, as we let it notice and register what’s happening around us. In both the standard office or high school setting, or any other setting that might be ringing bells for you, we are asked or ask ourselves to perform set tasks and achieve certain standards that have been set out before us and are already known. We are then also asked to do this under particular environmental circumstances, usually ones that don’t enable our bodies and minds to move. Let’s think of a time when we were absolutely, 100% dedicated to learning something new. I bet (and I’m basing this on what all of us in our second week of Life Coach Training with Martha Beck just learned) it was something you learned when you were a kid. And I bet that while you were doing it you felt free. Your body felt lighter, easier, less constricted. Your breath probably came easier. Your head might have felt less tight. When we resist feeling something, or the urge to do something, when we lock down our minds and our bodies, they will resist. And our ability to perform and achieve as we’re being asked to do will very likely tank. Even if we’re asking it of ourselves. We have the power to approach our lives with our own best interests at heart. We have the power to approach whatever it is we are asked to or choose to achieve from a place of freedom, of liberty, of play, of childlike concentration and delight. 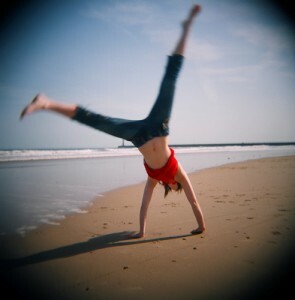 We have the power to let our mind and our bodies do cartwheels. Whenever we want. Something I emphasize over and over in my Stress Buster workshops is giving ourselves permission. To move our bodies. Or to simply take one, single, nervous system-balancing great big deep breath. Right at the end, I also suggest taking three minutes to watch a funny video on YouTube. Ignoring the longing to do this, which is actually a biological, programmed-into-our-DNA, NEED–only causes it to persist. It gets bigger. We resist it even more. It grows bigger. We resist it even more. And, soon, we’re at a total loss of action, mindlessly scrolling through Facebook posts or Twitter feeds, looking for something that helps us feel awake and active again. Let’s do cartwheels. Let’s get up from our desks and let out a great big belly laugh–I bet the people around you will get in on it, too. Let’s breathe deeply. Let’s let our minds become completely absorbed by the sight of a group of seagulls arcing through the bright blue sky. And then let’s come back to what we want to achieve, and do it even better.